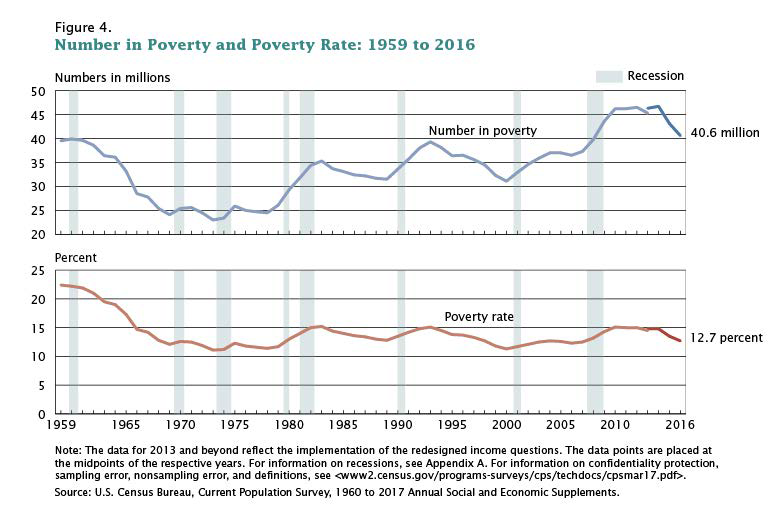 This morning the Census Bureau released new data on U.S. poverty for 2016. Wages are up a little, but considerably more people are working, particularly those working full-time (HT: Jed Kolko). As such progress is being made and poverty continues to decline. As our office has pointed out repeatedly in the past year, the Great Recession did not kill the business cycle. It just felt that way given the severity of the recession. Now that the expansion is reaching all corners of the economy and incomes are rising for those in the middle and bottom part of the income distribution, it is clear the feel-good part of the business cycle is here. Of course there is still much more room for further improvements. Household incomes for most Americans and Oregonians have been flat for 15-20 years at this point, however there are fluctuations around this stagnant trend. 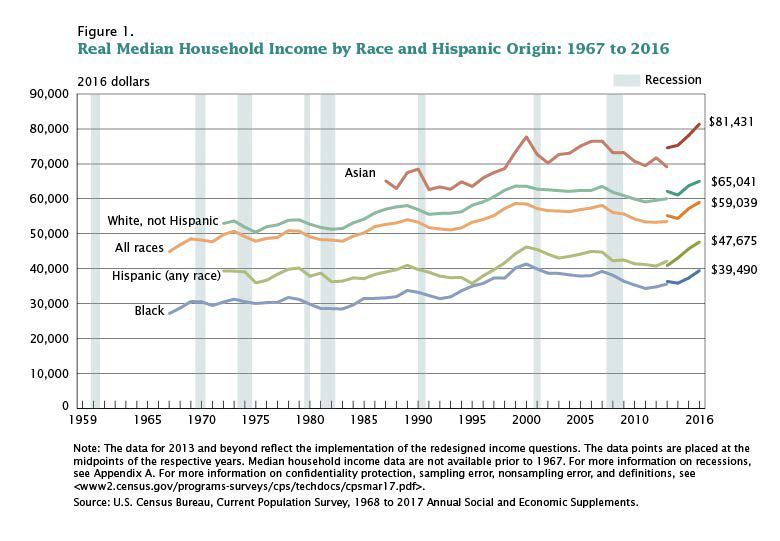 To date we’re on the upward trend but incomes are still at or below where they were in the late 1990s. Should the expansion continue for another year or three, household incomes will finally break through this long-run malaise. We are getting there, it’s just been a long and painful road. Oregon poverty data and for that matter all of the 2016 American Community Survey data will be released on Thursday. Expectations are for another good uptick in household income and decline in the poverty rate. For now here are a couple of high level U.S. charts from the Census report. Note that there is a 2013 methodological break in the Census data. Some historical comparisons are more difficult to make than others, depending upon the exact series you examine. That said, this change does not take away from the fact progress is being made in recent years. Also, data breaks, or series breaks are the worst. For more on our office’s Poverty and Progress series see our previous work on the business cycle overview, looking at the Portland region, Oregon overall, Josephine County (Grants Pass MSA), historical look at regional poverty in Oregon, and how some needs-based caseloads change over the business cycle. Note that the best local level poverty data comes from the Census’ Small Area Income and Poverty Estimates (SAIPE), which will be released in December. Thanks Guy; and yes they are! Small clarification: The 2016 one-year ACS estimates will be released on Thursday. The five-year ACS estimates will be released in early December. Thanks Bill. Yes, 1 yr ACS which works for state data and a large portion of the state. 5 yr and SAIPE needed for smaller geographic areas. I’m personally waiting the PUMS in Oct/DecJan for 1 Yr/5 Yr data, from which you can do even more interesting analysis!